The name comes from the "sessions" during which the Spanish viceroys listened to the complaints and petitions of prisoners confined inside San Pancrazio's Tower. 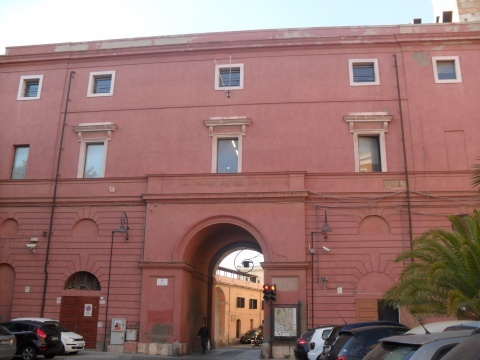 The pink structure built on two floors raised on a high base, in the centre of which San Pancrazio Gate, also known as Della Zecca opens up, connecting the two adjacent squares, Piazza Indipendenza and Piazza Arsenale. The building, dated back to the beginning of the seventeenth century, originally had only a level, but in 1825 it was subjected to important changes in order to elevate the structure. At the end of the nineteenth century, the prison was transferred to Buon Cammino, and the buildings adjacent to San Pancrazio’s Tower were abandoned or used for other purposes. For many years in the twentieth century it housed the collection of the National Art Gallery of Cagliari.